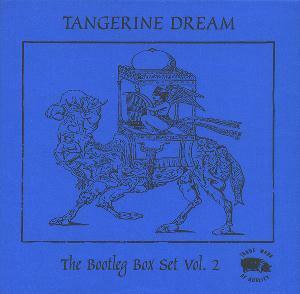 Like Volume 1, Volume 2 of the "Bootleg Box Set" series includes five TANGERINE DREAM concerts, between 1976 and 1983 this time. This means it features three different line-ups: one with Peter Baumann, one with Steve Joliffe and Klaus Krüger, and the last one with Schmoelling. Although the covered period is larger and the music is more varied than in the first box set, there are less genuine novelties here, as the band was already less improvising and began playing their studio material live from the beginning of the 80's. Like Volume 1, the tapes were remastered by Jerome Froese and, still like Volume 1, the artwork is awful again. Despite its good recording quality and year, the first concert, Nottingham 1976, is not the most convincing. It contains good moments, such as reusage of themes from "Ricochet" and "Stratosfear", as well as partial drafts of future tracks of "Sorcerer" and "Encore". However, the overall sounds a little repetitive and lengthy. A pleasant but uneven performance, less interesting than the ones from "Bootleg Box Set Volume 1". The second concert was recorded during TD's 1977 North American tour in Washington, the last one with Peter Baumann. Like all performances of the tour, it opens with "Cherokee Lane" and "Monolight". The rest consists of previously unreleased tracks, mostly improvised, in the style of "Encore" and "Sorcerer", with sci-fi effects and pre-trance sonorities futuristic at the time. Froese's distorted guitar gets pretty wild too by moments. However, despite all these features, the music itself is quite repetitive and not that interesting, the best passages being "Monolight" and "Octagon". Furthermore, the sound quality is average. I'd better recommend the Montreal or Detroit concerts, more inspired and now released as part of the Bootmoon series. The third concert, Hamburg 1978, is the curiosity of the box set. Quite original, it is one of the few recordings starring the controversial "Cyclone" line-up, ie. vocalist Steve Joliffe and drummer Klaus Krüger. The tracks reuses the electronic sequences from "Bent Cold Sidewalk" and "Madrigal Meridian", and each musician uses his instrument, or voice, to fan the fire, like a long meditative trance. You have to be concentrated to really "enter" the music. Then you'll be in for an unique and unusual TANGERINE DREAM performance. The fourth concert was recorded at Newcastle in 1981, in a transition period between "Exit" and their next albums, "White Eagle" and the live "White Eagle". It features drafts for "Logos Part 1" and "Mojave Plan". However, more interesting here are the tracks unreleased in studio versions. Sobornost is a nice icy and oppressive tune, that will be remastered and overdubbed on the "Antique Dreams" compilation. The dynamic "Bondy Parade" can also be found with a better quality, with overdubs too, on the official live album "Sohoman". "Therman Inversion" is another highlight of the performance, this trippy long transition is very cool and will be played at 1982 Australian concerts. Thus, the genuine novelty here is "Digital Times Suite", containing slight glimpses of "Convention of the 24", but overall rather lengthy and average. The fifth and last concert was recorded at Frankfurt in 1983, for the anniversary of the death of German actor Rainer Werner Fassbinder. Edgar Froese composed the soundtrack of the last film he starred in, "Kamikaze 1989". Shortest of the box set with a duration of only 35 minutes, the performance is made of extracts from TD's "Logos", "Poland" live releases, as well as Edgar Froese's "Flying Kamikaze", from "Kamikaze 1989" soundtrack. The music itself is good, but it does not features any previously unreleased tracks, as they can already can found on official albums, in better quality. The 1982 Croydon concert inclusion would have been a better choice, as it contains the cool "Logotypes" suite, not officially released. "Bootleg Box Set Volume 2" is less fascinating than the first volume, in which all material was entirely new as all performances were improvised. The choice of the two concerts with Peter Baumann is not the best, and the fifth concert is a bit useless. Highlights of this box set are thus the Hamburg 1978 concert featuring the "Cyclone" line-up, pretty unusual and incantatory and Newcastle 1981, that shows the band's creativity was still intact at the dawn of the 80's. Not bad, but for TANGERINE DREAM connoisseurs only.